Anthony Germain on the old, security conscious ways of the New China. On Oct. 1, the Chinese will hold a good old-fashioned, Communist parade in which 200,000 marchers will flip colour-coded cards with the Olympic precision that dazzled so many of us last year at the Summer Games. 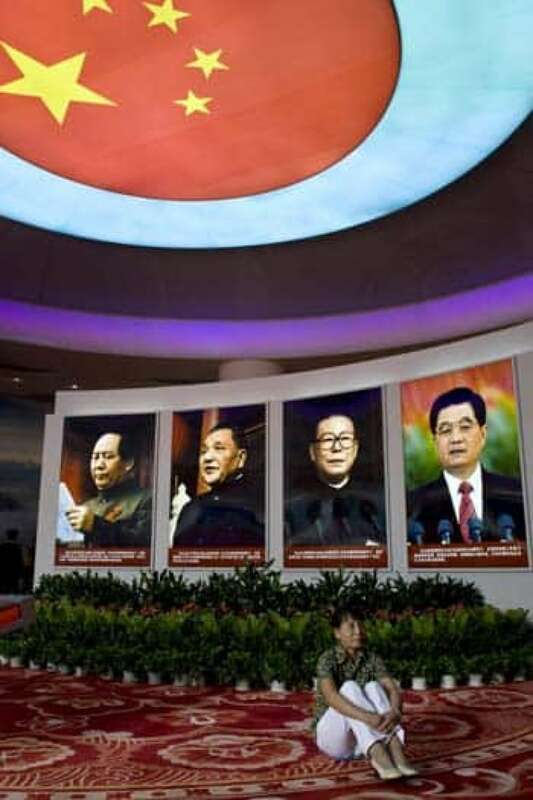 It's the sort of parade the Communist Party organizes once every decade to celebrate its national day and the focus of this year's extravaganza is supposed to be the New China — the China that has evolved since Mao proclaimed the People's Republic 60 years ago. Too bad the people aren't invited. In Beijing, every neighbourhood and district, each thoroughfare and alleyway, that touches upon the parade route will be blocked off. The rehearsals that have intermittently shut down the city have been as much about making sure people can't get too close to the action as they have been about glorifying six decades of Communist rule. Tiananmen Square is infested (as usual) with undercover police. 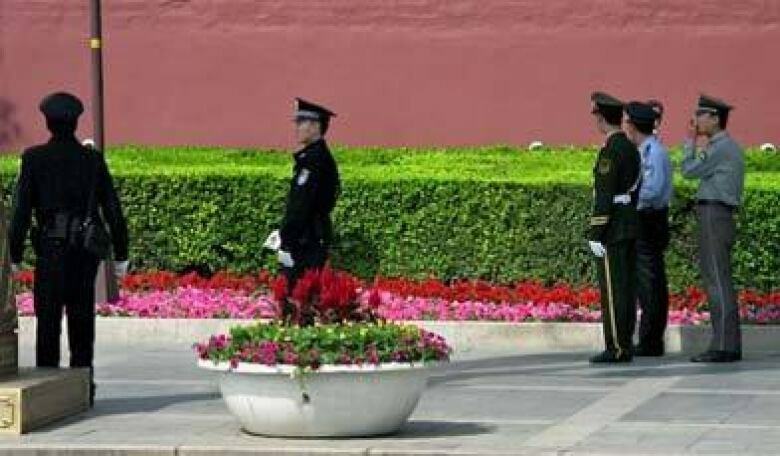 But, in the lead up to the big birthday bash, Beijing is also blanketed with uniformed types on the lookout for potential troublemakers. The recent random stabbings with hypodermic needles in the Muslim province of Xinjiang has added an extra layer of paranoia to the ever-cautious security authorities. Getting on my bike to go to work the other day, a man with a bright red arm band beckoned me to stop and said I should make sure my foreign credentials are registered with the local police station. One hundred metres down the road, two women wearing the same arm bands were also making sure everything was in order. Another hundred metres brought more people with bright arm bands. As much as this year's festivities are supposed to be about the New China, the feel of Beijing these days is much more that of the Old China. The combination of neighbourhood snoops, armed and un-armed police, soldiers, and other security personnel has recreated a capital city that Mao, no doubt, would have approved. The occasional ID verification at a checkpoint is merely a slight irritation, of course. But just try to find a place from which to watch this glorious celebration of nationhood. At a party recently, I met senior people from four different western hotel chains whose experiences can tell you much about how China really operates. (I can't divulge their names or their hotels, but suffice it to say they are hotels Canadians would immediately recognize). For example, NONE of the hotels along the downtown parade route through to Tiananmen Square are allowed to rent any rooms that face the spectacle. In most instances, this means thousands of rooms have been ordered to remain vacant. The ritzy, Singapore-based Raffles hotel, which occupies a marquee location in the city centre, will be completely shut down: the Communist Party has booked every room from September 26 until October 2. One hotel clerk I called said: "Uh, oh, we haven't been shut down. The government has booked the rooms and they are paying us a, uh, special rate." I couldn't get any clerks to divulge just what that special rate was. The hoteliers I met explained that they're used to this kind of thing. "It's all just part of the cost of doing business in China," one of them said in a rather annoyed tone of voice. Though not directly related to the October 1 celebrations, western hotels have been warned they cannot show western newscasts (BBC, CNN, etc.) in any so-called public areas of their establishments. That is not so unique for the lounges and bars, which are now perpetually tuned to Chinese state television and inoffensive sporting events or the ubiquitous documentaries on Kung Fu. But for the hotelier who invested heavily to install state-of-the art treadmills — with built-in TV screens so their business guests could watch REAL news as they sweat away the pounds — this has been a real issue. Those screens have to remain blank because the fine for showing western newscasts is the equivalent of about $10,000 per TV screen. Mind you, visitors are completely free to watch western newscasts to their hearts' content in their hotel rooms. You just don't want these things out in the open, probably so that the ordinary Chinese are not left confused by any contradictory information they might see being imparted. Less comprehensible are some of the other rules that determine what western hotels can and can't do. For example, they need to apply for licenses to make fresh squeezed orange juice. Apparently, this is a food-safety issue, although one manager confided he was pretty certain the fee for purchasing this license never reaches a government office and is simply stuffed into the pockets of the officials who demand it be paid in the first place. Then there is the recently promulgated Female Sauna Safety Regulation. Last month, certain inspectors informed western hotels, which offer luxurious spa and sauna services, that women were no longer allowed to take baths. Showers? No problem. Baths? No way. Officials explained that once a month women are afflicted with a certain bodily metamorphosis that could result in "undesired excretions." Men are free to bathe, shower and otherwise frolic in the hot tubs, but women need to be told they cannot take baths. How such regulations are to be enforced is left up to the hapless hotel staff. As one hotel official put it, "You try telling a woman who has paid $200 to be wrapped in seaweed that she can't take a bath!" As it turns out, I don't need to book a room to watch the parade. The CBC office has a pretty good view of the route. However, we have been told to keep the blinds down and stay off the balcony because of the snipers. The closed streets, the banned saunas, the snipers. At the moment, everything in Beijing is the way officials like it — under control. All is ready to celebrate the New China and its openness.